Utopia Contemporary Art - CAMPAGNA - RASSEGNA DELL’ACQUA - 'A CHIENA (Chiena Art Festival): Lulu Lolo - "Pilgrimage by Proxy: Paris Chapter"
Lulu Lolo - "Pilgrimage by Proxy: Paris Chapter"
The Pilgrimage: The search began as I walked past the 20 statues of the Queens of France—(thinking of how few statues to women there are in New York City). 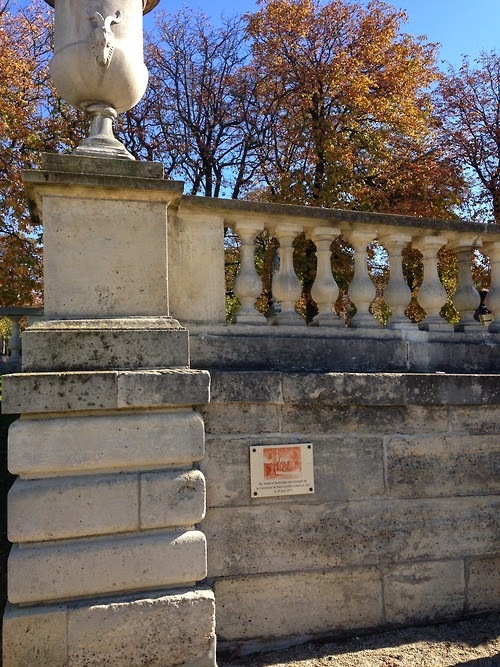 I scanned the walls around the large pond in the center of the park, looking for the plaque. As I walked, I thought of the past history of the park with people reading books and now all are intent on their laptops and cell phones. Then there it was. I found the plaque! It marks the actual spot where thousands were executed against this wall. This moment of history, this plaque, goes unnoticed surrounded by people in chairs sunbathing, eating lunch, and in romantic interludes oblivious to the history of the past and also oblivious to our pilgrimage. I stood there and marked the spot and saluted the Communards and you Fraser Ottanelli for your passion to honor history. 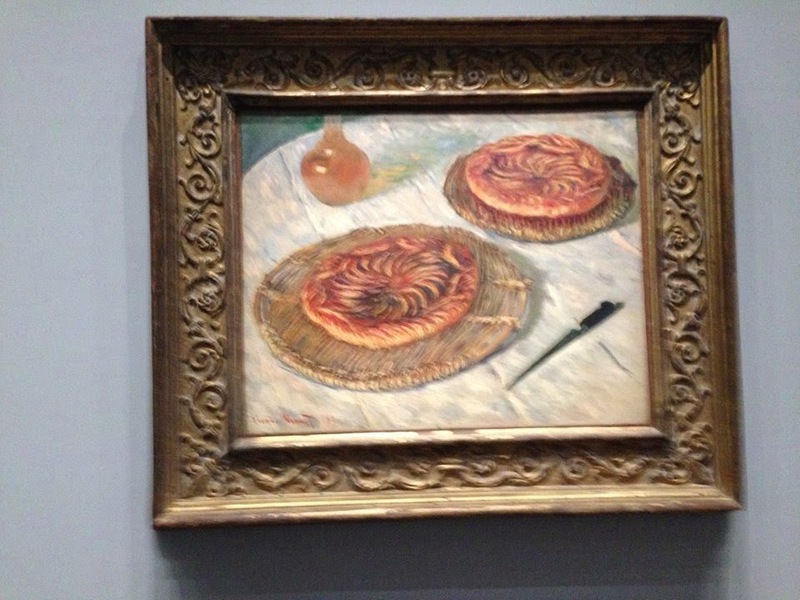 The Pilgrimage: Sometimes the simplest request becomes the most difficult—I wanted to honor Aimee’s request for an apple—but I was consumed with finding the perfect apple and the perfect apple tart—nothing seemed to measure up. I went to market place after market place and shop after shop—I wanted a beautiful display of apples that enticed me—to pick one. 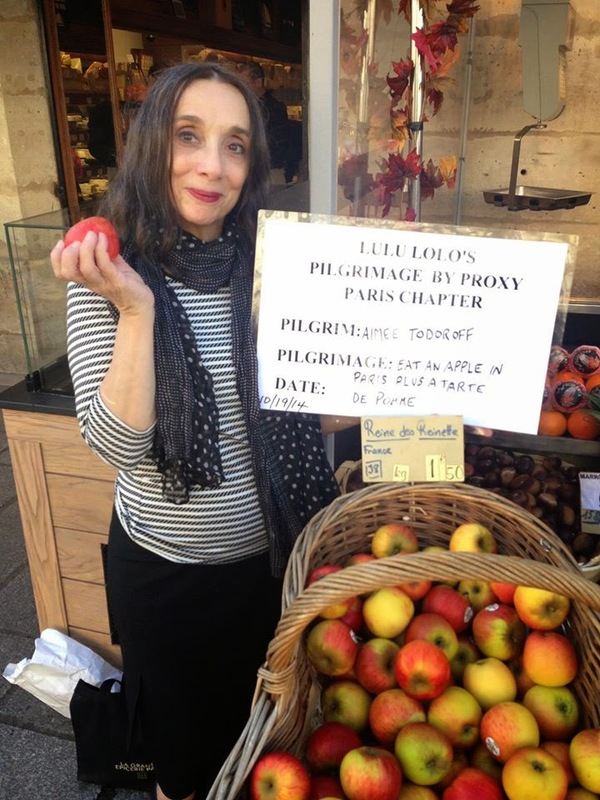 And then it happened: in one of my favorite areas in Paris on the Rue Saint Antoine, a basket of apples beckoned and I took a bite! Success! the apple was delicious and juicy and one of the best I ever had. I had tasted an apple in Paris for Aimee. I will be presenting Aimee with the bag that held my apple purchase. 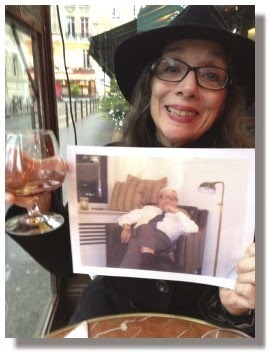 Actress and comedian (the Fabulous) Lulu LoLo and her husband, Dan, come to Paris often. Their dream to spend several months here came to a tragic halt this past year thanks to a series of family illnesses and issues that kept them closer to home -- New York City...but it didn't keep Lulu down. In fact, NOTHING keeps Lulu down that I know of. She and Dan arrived in Paris this past week with five large purple suitcases filled with Lulu's eclectic wardrobe and a number of 'missions' -- or should I say 'pilgrimages?' 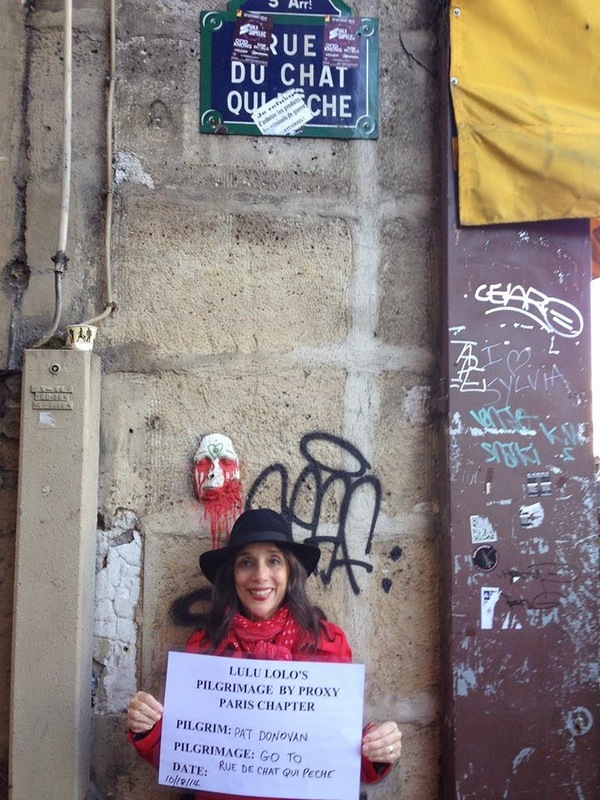 In fact, that's become Lulu's "raison d'être" -- to do things and go places in Paris not for herself, but for other people! 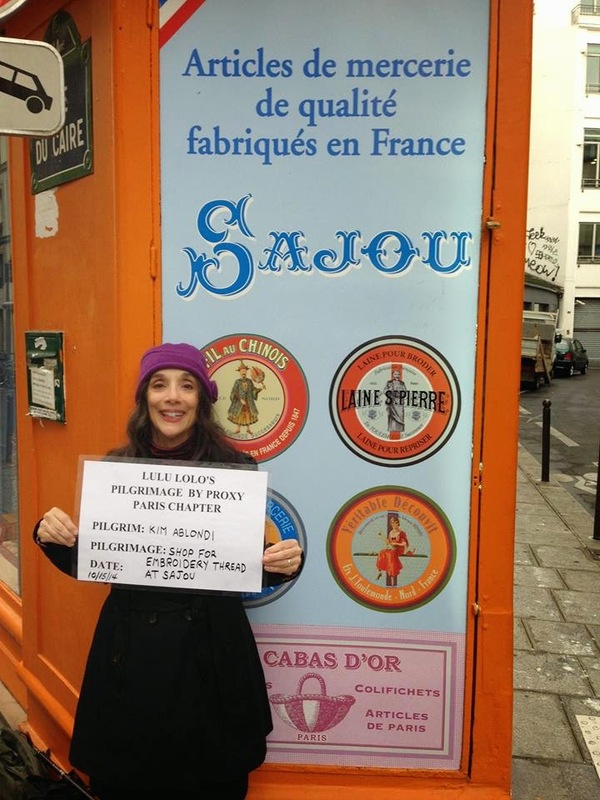 At brunch Sunday she showed us a list of about a dozen (or more) pilgrimages planned for her month in Paris. Lulu is no ordinary actress/comedian, obviously. And to us, she's much more than that. She's a more-than-real person with a heart of gold, an amazing sense of humor, a streak of creativity to rival any great right brain and is a total pleasure to know. It's no wonder her friends and admirers ask her to do some pretty zany things on their behalf to which she wholeheartedly says, "Mais oui!" 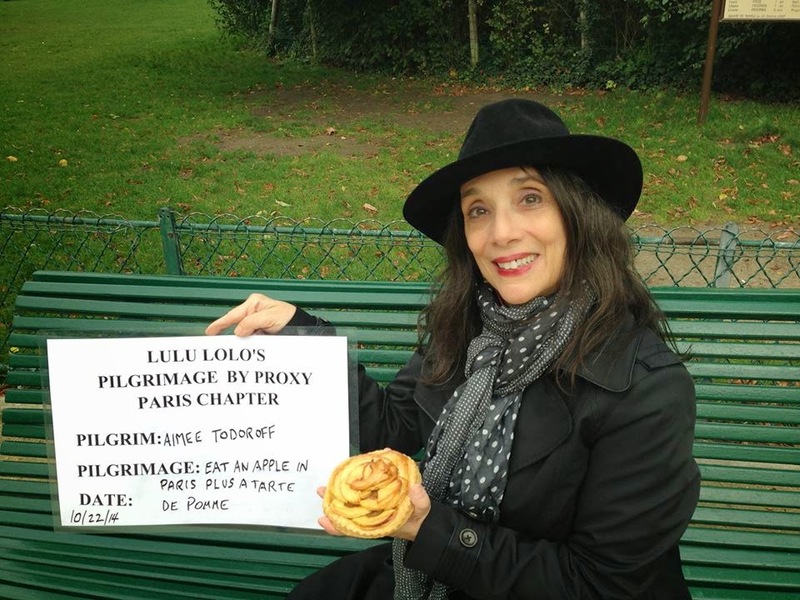 In her own words, Lulu admits to "taking photos of the houses where the Brownings lived in Paris for an art historian lecture," "lighting a candle for someone at Notre Dame," "visiting a special grave at one of the cemeteries" and "bringing an author's book to a bookstore here." It's a rather unique service she provides -- one which is blossoming into a serious reason to be here, besides just the usual reasons to visit Paris. * Or I will perform an action you have always envisioned...You will be by my side in Paris. 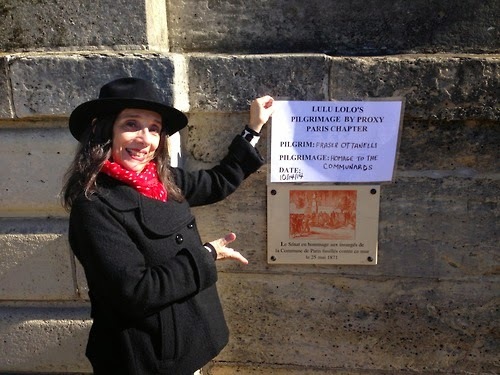 * Visit where Jean Claude Vasseux lived with his family and the famous boulangerie nearby for the Kouglof in his memory. * Go to the Eglise de la Sainte-Trinité for an organ concert. * Bring a copy of “King Lear of the Taxi” to Shakespeare & Company. * Hear the great Cavaillé-Coll Organ at Saint-Sulpice. * Pick up fallen leaves (red and yellow), put them in a bag and scatter them in the wind from the middle of the Pont des Arts so that a swarm of leaves flies into the river. 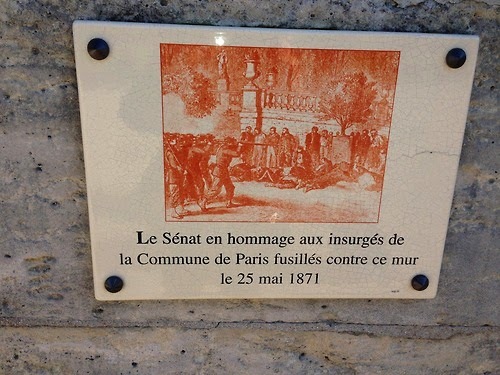 * Take a photograph of the plaque to the Communards executed in the Luxembourg Gardens that's on a wall near the boating lake in the center. 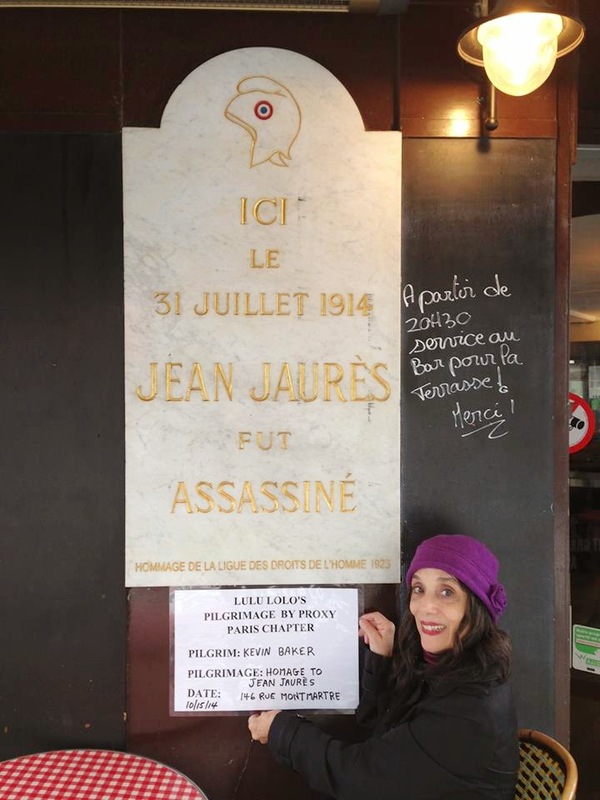 * Visit the Café du Croissant where Jean Jaurès was assassinated. * Visit Sajou for "Articles de mercerie de qualité fabriqués en France" at 47, rue du Caire 75002 Paris and purchase vintage boxes and cotton embroidery thread on cards,particulary the one with the Eiffel Tower. * Visit my favorite Church -- Sainte-Chapelle and just walk around the interior and exterior for an hour. * Eat an apple -- crisp fresh slices or baked in a perfect pastry, it doesn't matter. * Visit the Théâtre des Automates at the Musée des Arts et Métiers. * Ride on a merry-go-round. 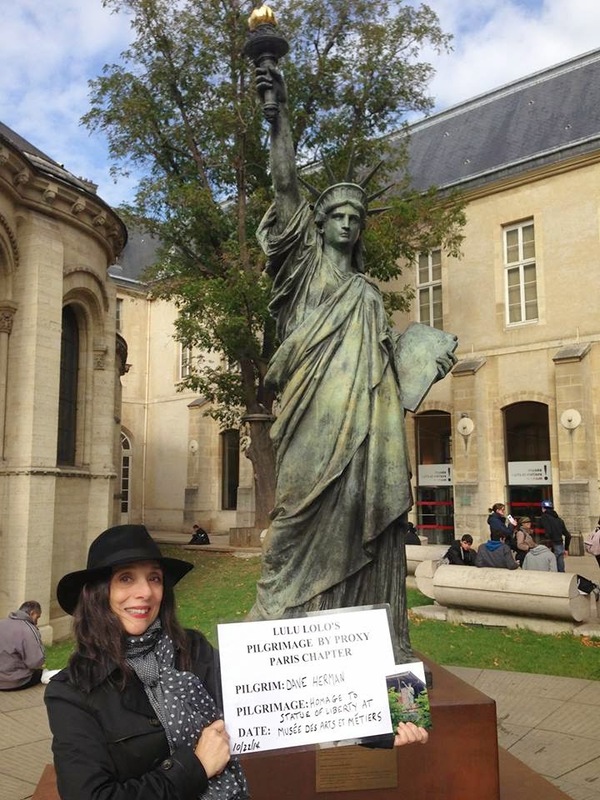 * Take a rock from beside the Statue of Liberty in Hawaii and place beside the Statue of Liberty in Paris. 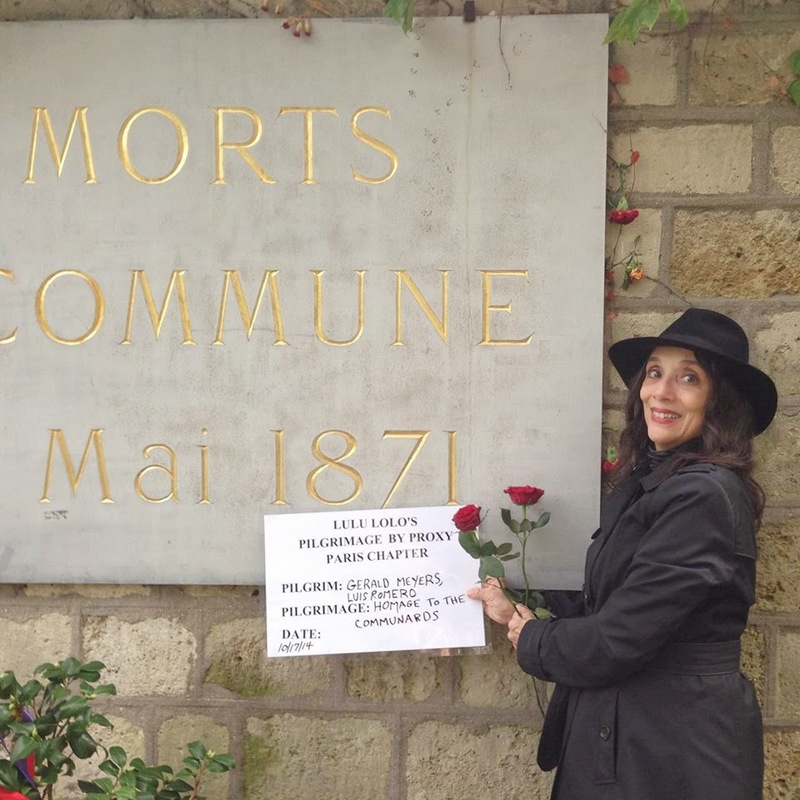 * Walk fluidly through the Père Lachaise Cemetery wearing a very long handpainted scarf focusing on your solar plexus to place a stone near Isadora Duncan's tomb to honor her. 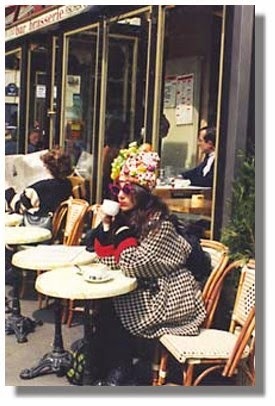 Lulu postcard Cafe - Pars, France* Go and see and sit in anything "impressionist"...the Musée d'Orsay...any cafe that is still open that used to be an impressionist hangout. * Visit the Manufacture des Gobelins tapestry museum. * Visit the Musée national du Moyen Age, formerly Musée de Cluny and find the Rose d'Or. * Visit the Basilique-Cathédrale de Saint-Denis, spend a few midday hours watching the subtle play of colored lights reflecting through the stained glass windows and on to the stone work. * Eat a plate of raw mussels. 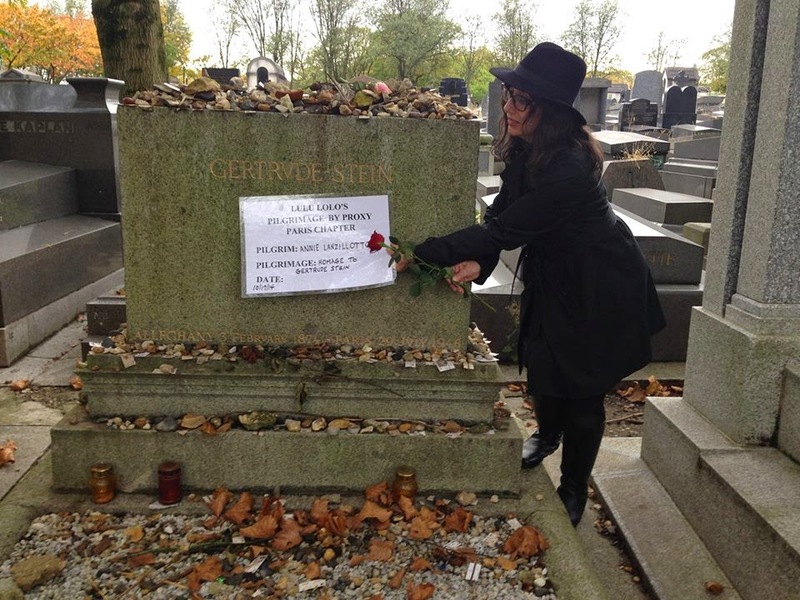 * Go to a Gertrude Stein spot in Paris and write a power prayer. * Take a pair of my shoes and walk in them. 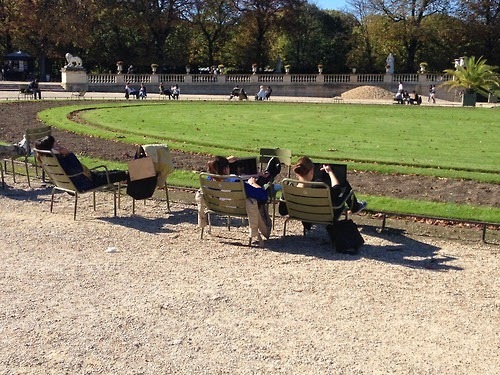 * Walk from the Louvre to the Jeu de Paume collecting 24 fallen leaves from the ground, placing them in a ziplock bag. Take our 12 leaves from the bag and boil them until they become a mash. Spread the mash on the paws of the first lion sculpture you encounter in Paris. Transport the remaining 12 leaves to New York and I will collage them on a white archival museum board, dated and framed or otherwise kept in safe storage for a long long time thereafter. 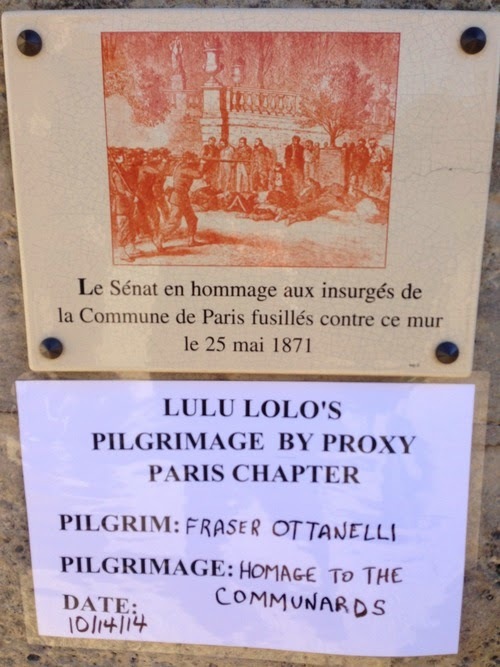 LuLu may be booked up this trip, but if you have a pilgrimage you'd like done by proxy, perhaps for the next one (if it's interesting enough! ), LuLu will grant you your wish! or email: LuLu LoLo at fabulouslululolo@gmail.com. 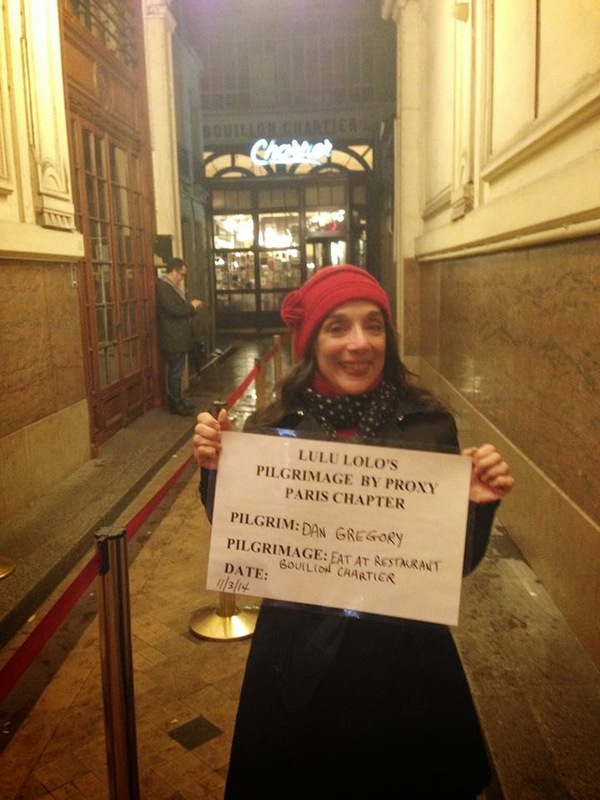 LuLu LoLo’s Symbolic Journeys for People—an invitation. As I wander Paris, with each step you will be with me in spirit. I will walk in your shoes. 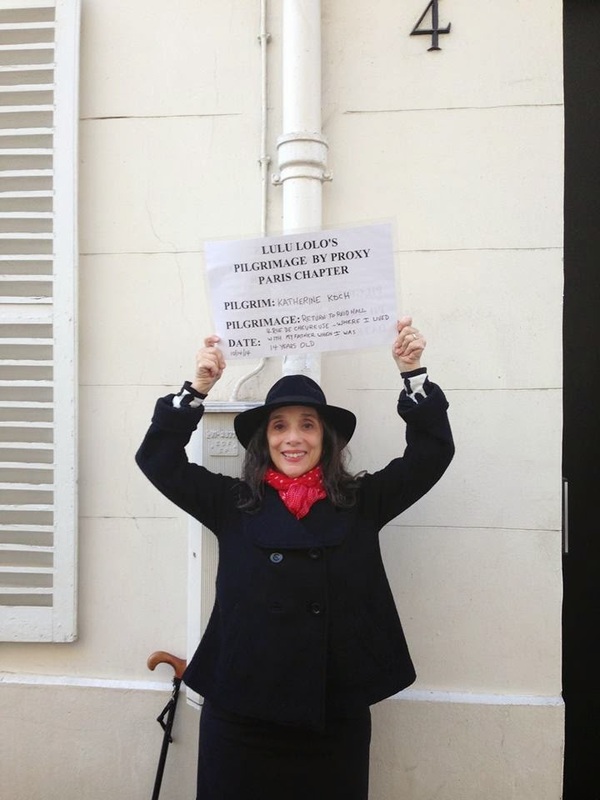 LuLu LoLo is a New York based international performance artist, playwright/actor, and multidisciplinary artist. 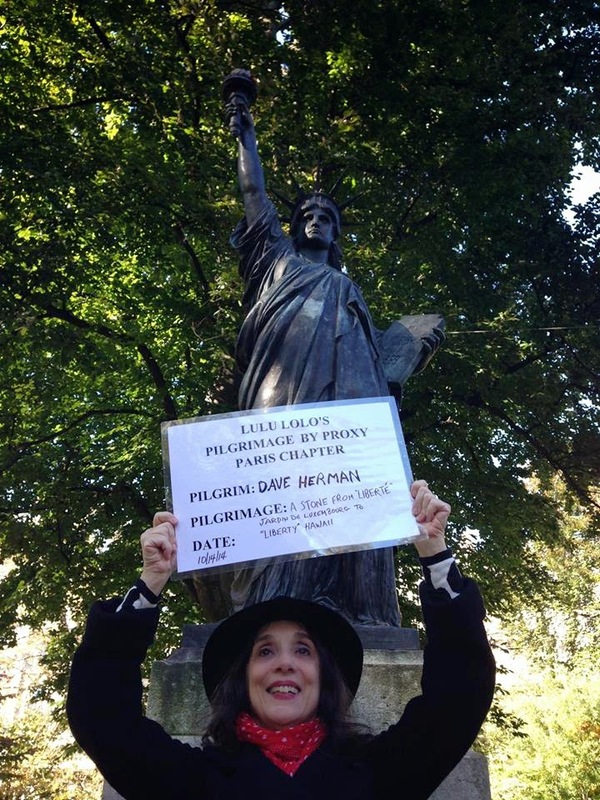 As a performance artist, symbolism, ritualism, memory, and myth, all contribute to the aesthetic spirit of LuLu’s art as seen in her performance as “Mother Cabrini, Saint of the Immigrants” in Campagna, Italy; and Paris, France, and when she appeared attired in top hat, white tie and tails as “The Gentleman of 14th Street” recreating the ritual of “tipping one’s hat as a sign of greeting” for Art in Odd Places: Ritual. LuLu recently performed as “The Gentleman/Mayor” at New York’s Flux Factory’s “Banquet for America”. 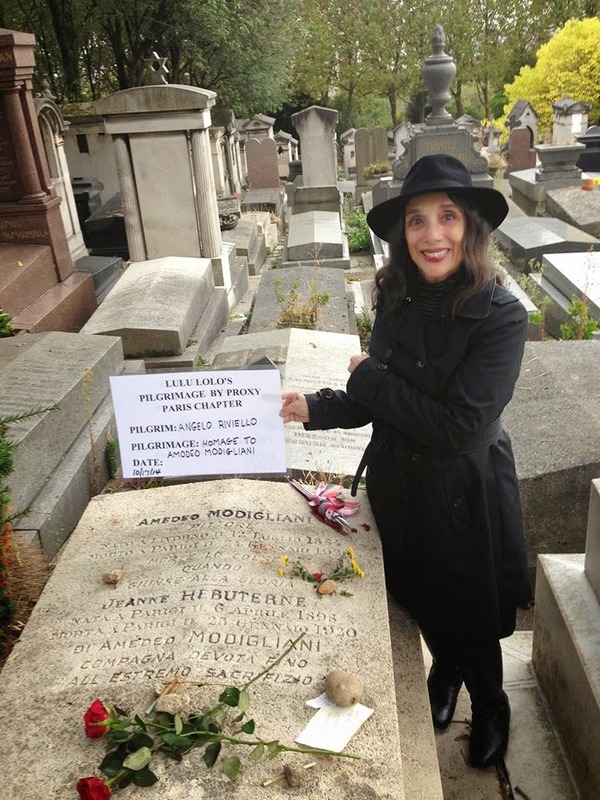 LuLu combined her passion for research with performance art when she performed as “14th Street NewsBoy” attired in knickers and a cap for Art In Odd Places: Sign, New York City, hawking four weekly issues of the “14th Street Tribune” which she researched and wrote recalling the famous, notorious, and tumultuous events from the history of 14th Street. 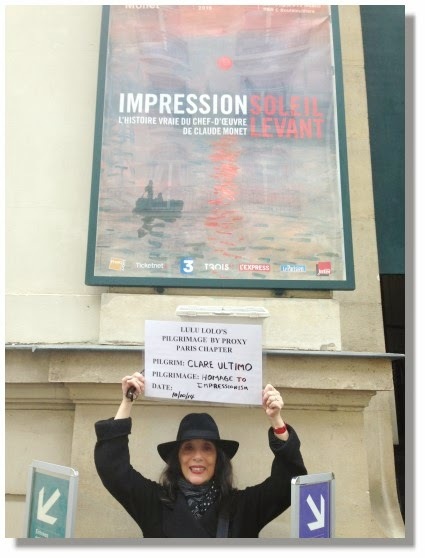 LuLu has also performed as “Dust Collecting Specialist”, in collaboration with the John Erickson Museum of Art (JEMA) collecting art museum dust in the major museums of Genoa, Italy; Paris, France; Belfast, Northern Ireland; and New York. LuLu has written and performed seven one-person plays Off-Broadway highlighting her Italian immigrant family heritage, her passion for historical research and social justice especially as pertaining to the dramatic struggle of women in New York City’s past on such subjects as the Triangle Shirtwaist Factory fire; the lesbian lover of murder victim Kitty Genovese; the murder of Helen Jewett; women who fought in the Civil War disguised as men; and Aaron Burr’s tragic relationship with his daughter Theodosia Burr Alston. Her latest play portrayed the shameful treatment of the women consigned to the Magdalene Laundries in Ireland. A work in progress “Obits” a play based on lives revealed in obituaries was developed while LuLu was a Lower Manhattan Cultural Council Writer in Residence. Selected NY venues: New York International Fringe Festival, Metropolitan Playhouse, Wagner College, Hofstra University, StonyBrook University, Columbia University, and Columbus, Ohio National Gay and Lesbian Theatre Festival. Her work has been reviewed by The New York Times, Village Voice,Nytheatre.com, Bill Kaiser: On the Purple Circuit”, and in “A Lived History under Scrutiny: Italian American Performance Art", by Joseph Sciorra in Teaching Italian American Literature, Film, and Popular Culture, The Modern Language Association of America, NY, 2010. FORNACE FALCONE - "Cilento Outlet Village"